A home or stationary oxygen concentrator is a medical device that delivers medical grade oxygen (greater than 88% pure oxygen) to a patient via either a nasal cannula or mask. Oxygen Concentrators are medical devices that deliver medical grade oxygen (greater than 88% pure oxygen) to a patient via either a nasal cannula or mask. Air generally contains mostly nitrogen and only about 21% oxygen. Concentrators remove the nitrogen and "concentrate" the oxygen. 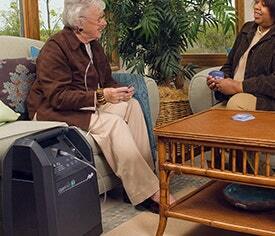 Oxygen concentrator output is generally measured in LPM (liters per minute). A concentrator has two cylinders filled with zeolite which selectively adsorbs the nitrogen in the air. In each cycle, air flows through one cylinder at a pressure where the nitrogen molecules are captured by the zeolite, while the other cylinder is vented off to ambient atmospheric pressure allowing the captured nitrogen to dissipate. Typical units have cycles of around 20 seconds, and allow for a continuous supply of oxygen at a flow rate of up to approximately 10 liters per minute (LPM) at concentrations anywhere from 25% to 95%. This process is called the pressure swing adsorption(PSA) cycle. Weight: The weight of home concentrators will vary from the lightest on the market today is 31 pounds to older units that can weigh more the 50 pounds. Dimensions: Dimensions will vary with both manufacturers style and the age of the unit but all units are basically a "cube" shape of approximately 12 - 15" wide by 9" - 15" deep by 23" -28" tall. Noise Level: Noise level on units is measured in decibels. The newer "quiet" units are approximately 45 decibels, older units typically do not have the same sound baffling and are slightly louder( 50 - 60 decibels). Additionally, as units age, the compressors can become louder. As a comparison, a "library whisper" is considered to be approximately 30 decibels and "normal conversation" is considered to be in the 60-70 decibel range. Temperature Operating Range: Home oxygen concentrators are specified to operate in a normal home environment typically between 45 degrees F and 90 degrees F. Outside of these ranges, the unit may not function properly. Altitude Operating Range: Altitude specifications for home concentrators vary slightly. Most are specified to operate up to 7500 - 8000 feet. This specification limitation is because the oxygen percentage in the air at higher altitudes decreases. Warranty: Warranties vary with manufacturer. Most manufacturers have a 3 or 5 year warranty. Patients should clarify both the length of any warranty and the start date of the warranty as some manufacturers start the warranty when the unit is shipped to the retailer.